Title Card: In the darkness you could hear the crying of women, the wailing of infants, and the shouting of men. Some prayed for help. Others wished for death. But still more imagined that there were no Gods left, and that the universe was plunged into eternal darkness. - Pliny the Younger, A.D. 79. Courtesy of Warner/Chappell Music Canada, Ltd.
Q: What is Pompeii about? POMPEII is a disaster film directed by Paul W.S. 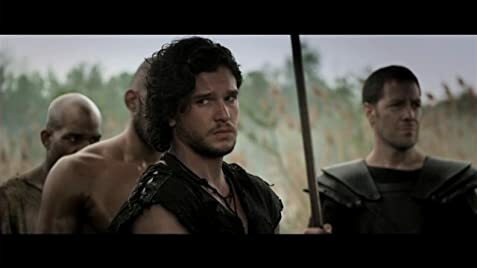 Anderson, starring Kit Harrington and Keifer Sutherland. The film revolves around a boy who grows up to be a slave and eventually witnesses one of the biggest volcano tragedies in Pompeii. Pompeii is quite an enjoyable time. I went in the cinema expecting a complete dud of a film, but I came out surprised at how much I had underrated the film. Inspite of the poster and trailer of the film failing to impress, the performances are great, and the action was extremely entertaining. The effects and directing were top-notch, especially after the volcano eruption commences. 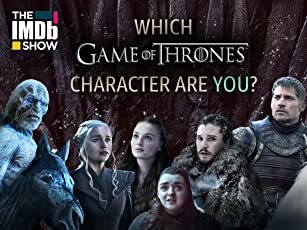 However, the film doesn't have a GREAT storyline and it does have that 'fake' factor which involves every other person dying and the main hero surviving through all the circumstances. ALSO, a gentle reminder about how the first half of the film is rough copy of Gladiator and the second half is a direct copy of Titanic. A special mention about the 3D effects of the film. It truly is worth its price, because it just enhances the whole experience of the film, and adds to the enjoyable factor of the film. 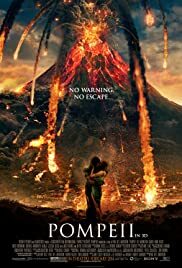 In conclusion, inspite of its flaws, POMPEII is quite a good film. Don't go in expecting the best movie of 2014, and go in with an underrated opinion of the film, like I did, and promise that you'll have a great time.